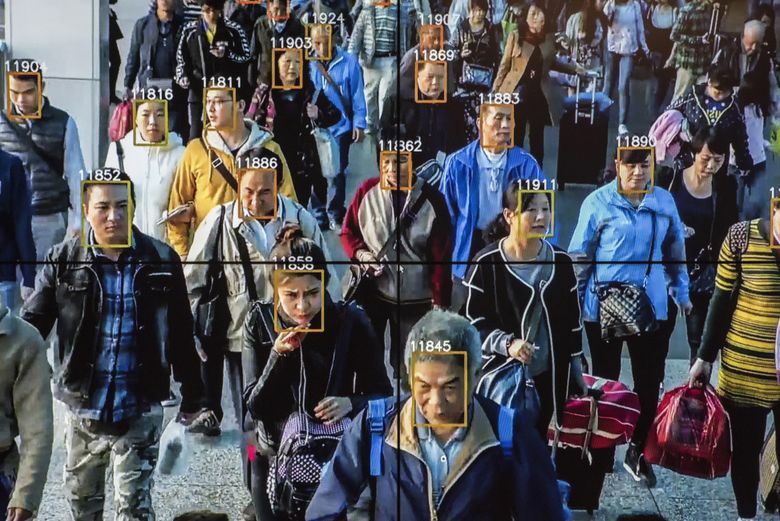 One project, called “Sharp Eyes,” will use facial recognition and artificial intelligence to analyze security videos, track suspects, spot suspicious behaviors and monitor the comings and goings of the country’s 1.4 billion people. CHONGQING, China — For 40-year-old Mao Ya, the facial-recognition camera that allows access to her apartment house is simply a useful convenience. At the back end, these efforts merge with a vast database of information on every citizen, a “Police Cloud” that aims to scoop up such data as criminal and medical records, travel bookings, online purchases and even social-media comments — and link it to everyone’s identity card and face. A goal of all of these interlocking efforts: to track where people are, what they are up to, what they believe and who they associate with — and ultimately even to assign them a single “social-credit” score based on whether the government and their fellow citizens consider them trustworthy. In this effort, the Chinese government is working hand in glove with the country’s tech industry, from established giants to plucky startups staffed by graduates from top American universities and former employees of companies like Google and Microsoft, who seem cheerfully oblivious to concerns they might be empowering a modern surveillance state. The name of the project is taken from the Communist slogan “the masses have sharp eyes,” and is a throwback to Mao Zedong’s attempt to get every citizen spying on one another. The goal, according to tech-industry executives working on the project, is to shine a light into every dark corner of China, to eliminate the shadows where crime thrives. The Sharp Eyes project also aims to mobilize the neighborhood committees and snoopy residents who have long been key informers: Now, state media reports, some can turn on their televisions or mobile phones to see security-camera footage, and report any suspicious activity — a car without a license plate, an argument turning violent — directly to the police. By 2020, China’s government aims to make the video-surveillance network “omnipresent, fully networked, always working and fully controllable,” combining data mining with sophisticated video and image analysis, official documents show. China is not alone in experimenting with these new technologies. The FBI’s Next Generation Identification System uses facial recognition to compare images from crime scenes with a national database of mug shots. Police forces have been using algorithm-based techniques for several years to predict where crimes are likely to occur. Chicago police identified and a court convicted a thief using facial-recognition technology in 2014, and Britain used a Japanese program called NeoFace Watch to spot a wanted man in a crowd in May. The United States, with around 62 million surveillance cameras in 2016, actually has a higher per capita penetration rate than China, with around 172 million, according to Monica Wang, a senior analyst in video surveillance and security at research consultants IHS Markit in Shanghai. Yet it is China’s ambition that sets it apart. Western law-enforcement agencies tend to use facial recognition to identify criminal suspects, not to track social activists and dissidents, or to monitor entire ethnic groups. China seeks to achieve several interlocking goals: to dominate the global artificial-intelligence industry, to apply big data to tighten its grip on every aspect of society, and to maintain surveillance of its population more effectively than ever before. 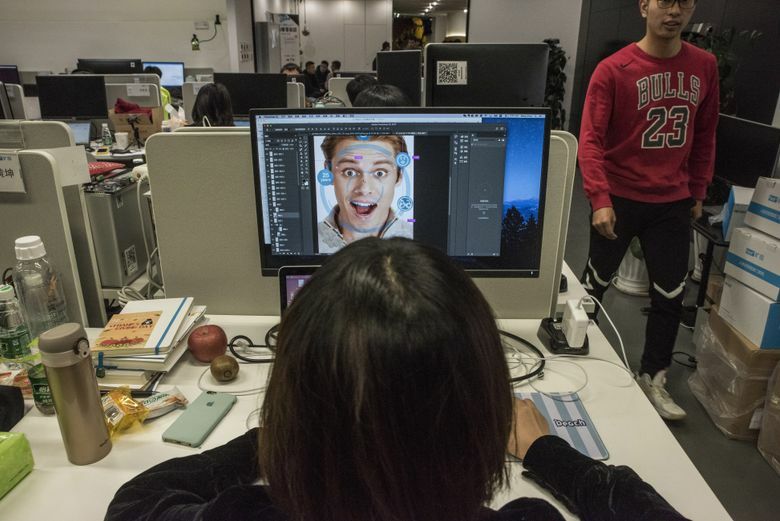 In the showrooms of three facial-recognition startups in Chongqing and Beijing, video feeds roll past on big screens, with faces picked out from crowds and matched to images of wanted men and women. Street cameras automatically classify passers-by according to gender, clothes and even hair length, and software allows people to be tracked from one surveillance camera to the next, by their faces alone. Gradually, a model of people’s behavior takes shape. “Once you identify a criminal or a suspect, then you look at their connections with other people,” he said. The startups also showcase more consumer-friendly applications of their technology. Companies like SenseTime, Megvii and Cloudwalk provide the software that powers mobile apps allowing people to alter, “beautify” or transform their faces for fun. Other ideas are struggling to move beyond the pilot stage: A plan to identify jaywalkers in Chongqing already has been abandoned, while residents have responded to facial-recognition gates on some apartment buildings in Chongqing and Beijing by propping the doors open. More than anything else, experts say, deep-learning technologies need huge amounts of data to come up with accurate algorithms. China has more data than anywhere else in the world and fewer constraints about mining it from its citizens.